We've wanted to meal prep for years and finally did it! Anyone else hear the words “food prep” and run away as fast as you can? Me too! We have loved the idea of a meal prep day and have talked about doing it for a few years now. Anytime my hubby and I try to plan a day to do it I just get overwhelmed by all the recipes, ingredients, the grocery trip, and actually making all that food. Honestly, I’ve used every excuse I could think of to not do it, all the while actually really wanting to do it. Why are we like that, anyway? Well, this past weekend we decided to just go for it! We didn’t have a ton going on and knew that all we needed was time to do it (that is our biggest excuse – but reality is we don’t want to make time for it). I started by looking up ideas from other healthy and fit people – we didn’t want to just have dinner planned and ready for the week but also wanted healthy food that wouldn’t taste totally boring after just a few days. I’m starting with just prepping dinners because having lunch and breakfast planned too is just waaaay too much to take on at the moment. I found a fairly simple outline from My Meal Prep Sunday which seemed pretty manageable. We made our grocery list and headed to Whole Foods as a family and hoped for the best! Haha. We usually don’t shop at Whole Foods because we’ve always thought it was just more expensive for the same quality of food, but some friends recently told us their prices are now on par with Publix, where we usually shop. 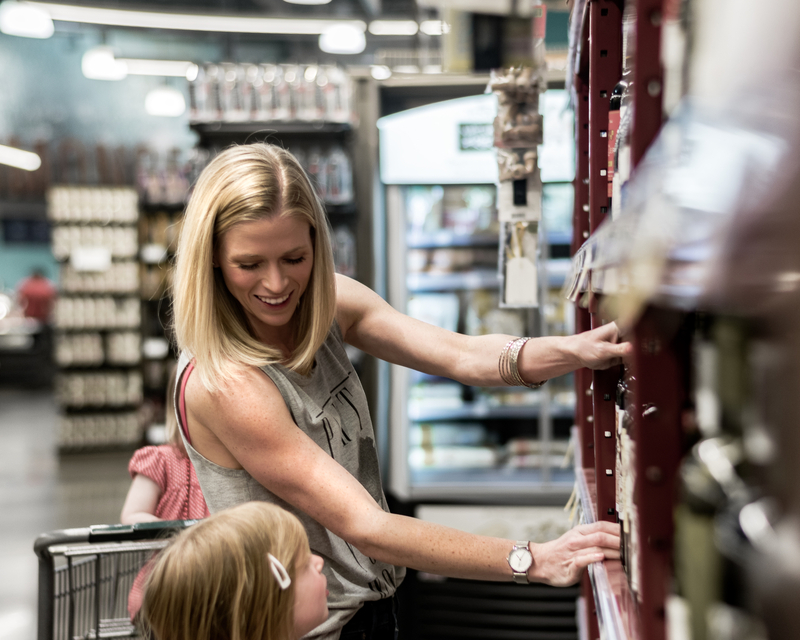 Grocery shopping is usually one of my least favorite weekly chores I do with the kids – and I usually only motivate myself go when we are low on coffee or half-and-half ☕😜. It was actually pretty fun going all together as a family (and how else would I get all these pictures if my husband/photographer didn’t tag along! haha). Sticking to a list is very helpful; we save money and buy less junk. Pro Tip: stick to shopping only the perimeter of the grocery store if you can, as the junk is usually only in the isles. Once we survived the grocery store (hey… it wasn’t all unicorns and rainbows!) we went home to unload and cook. Having David there cooking and prepping with me (and entertaining the kids when they needed it) made prepping so much easier! If you are like me and are having a hard time getting into meal prepping try to find a friend to help! We marinaded and baked the chicken, cut and cooked the veggies, and made some quick meatballs for a second protein option. During this week I only needed to cook up some quinoa, rice, or pasta, depending on what I felt like that day. Then I just had to choose a meat, veggie, and starch from the fridge and I was done! I really have loved not having to cook all this week; I don’t feel so rushed at dinner time and as a bonus, my kitchen is slightly cleaner. Yay for meal prepping! Now for week 2… we’ve got this! I hope you’ve enjoyed these photos as much as I enjoyed putting this all together for you! I really did have a blast (especially shooting some of the Instagram story videos, sorry if you missed them!). Also, I’m totally new to blogging and I’d love your feedback on everything from the photos, to the outfits, to my writing, product links, the website, etc.! Let me know what you think in the comments below, on my facebook, instagram, twitter, or any where else you might find me around. I’d honestly love to know what you think! If you really loved this post, please share it, pin it, or tweet it!